As part of Creative Corner, every week SEREN will look at the life of a famous artist. 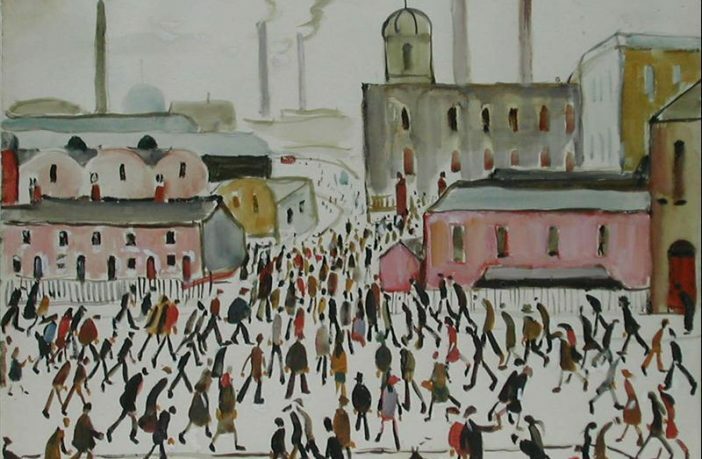 This week we turn to L.S Lowry. Laurence Stephen Lowry was born on November 1st, 1887 in Stretford, Lancashire, where his childhood was said to be difficult .He made few friends at school, and struggled to connect with his parents. They envied their friends ‘three splendid daughters’, as oppose to their ‘one clumsy boy’. 1905 saw Lowry securing a place at the Manchester Municipal College of Art, where he studied under the celebrated French Impressionist Pierre Adolphe Valette. In 1909, due to economic pressures the family relocated to the industrial area of Pendlebury, where the landscape constituted primarily of mills and chimneys. This contrasted to the leafy environment of his childhood, and would become a major influence on his work. 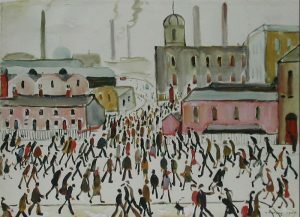 During 1915 Lowry graduated to the Salford Royal Technical College, where he continued to take classes up until the 1920’s. Here he learned how impressionism changed the way landscapes, including the city landscapes he favoured, were painted. Lowry admired Pre-Raphaelites such as Ford Madox Brown and Rossetti. Throughout the 20’s, Lowry also worked as a rent collector for the Pall Mall Property Company, but didn’t tell people as he didn’t want to be seen as a ‘spare time painter’ as oppose to a professional. 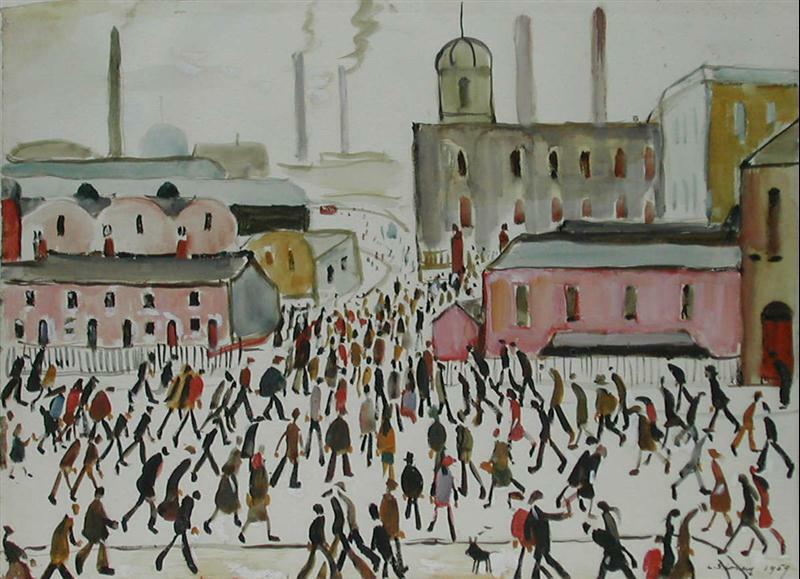 The job saw Lowry walking through the streets on a daily basis, where the scenes of people travelling would feature in many of his works. While creating drawings, Lowry would often smudge and erase his pencil lines in order to increase the ‘atmosphere’ of the piece. Simple colours such as ivory and Prussian blue became a staple of his work, which he attributed to being ‘a simple man’, who liked to use materials that could be worked with for a long period of time. After the death of his father in 1932, Lowry dedicated himself to looking after his mother until her death seven years later. During this time, he would paint at night whilst his mother slept, saying ‘she did not understand my painting, but she understood me, and that was enough’. Lowry began to suffer from loneliness and isolation during this era, which was reflected in the bleakness of his work, often featuring wastelands and derelict buildings. Following his mother’s passing, Lowry called painting his ‘salvation’. He held his first London exhibition the same year, and began to focus more on drawing solitary figures as oppose to buildings. He said ‘I feel more strongly about these people than I ever did about the industrial scene. They are real people, sad people. I’m attracted to sadness and there are some very sad things. I feel like them’. Lowry continued to paint into his late life, however was plagued by self doubt, questioning ‘Will my work last?’ He died in 1976, months before his record breaking exhibition opened at the Royal Academy. His total works include around 1000 paintings, and around 8,000 drawings, including ‘An Island’, and ‘Coming Out of School’, and he has since become one of Britain’s most celebrated artists.